For cancellations more that 48 hours before check-in time on the scheduled date of arrival – no charge. For cancellations within 48 hours – we will take payment for the first night of your cancelled stay. For customers who fail to show for their booking – we will take payment for the first night of your booked stay. For customers who fail to show for their booking – we will take payment for the first night of your stay. At Haka Lodge Taupō we offer a variety of up-market dormitory rooms for those travelling on a budget, and a wide range of private rooms for those who like their own space on the road. We welcome international travellers from all over the world, which means you never know who you might get chatting to in our large lounge, sunny outdoor patio and modern kitchen. 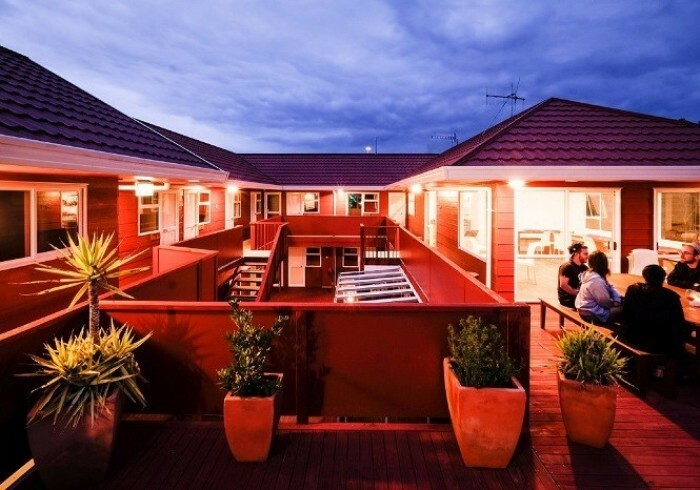 Haka Lodge Taupō has been set up by world travellers with all your backpacker needs in mind. We have a fully equipped kitchen, fluffy pillows, plenty of USB sockets, and that’s not even mentioning our volleyball court, BBQ, and super central location. We also know that your trip is about experiencing the beauty of New Zealand – that’s why our sun-filled deck has uninterrupted views across Lake Taupō to Mount Ruapehu, Mount Tongariro and Mount Ngauruhoe – a perfect place to relax after an adrenaline-filled day in Taupō. We also have an in-house travel desk where our friendly staff can assist you with booking unmissable local activities such as the famous Tongariro crossing, legendary skydiving and the best cultural tours on offer. Our staff are here to make your stay in Taupō a special time to remember. Great location – We are located within walking distance of downtown Taupō and Lake Taupō, with amazing views! Best bunk beds in town – Our bunks are custom built with privacy curtains, charging points, lights and storage! Hotel quality mattresses – We don’t believe staying at a backpackers means sacrificing comfort – that’s why we have hotel quality mattresses in all of our rooms – even on our bunks! Free unlimited wi-fi – Our whole lodge has free unlimited wi-fi for you to use during your stay here – so whether you want to watch Netflix or Skype home, we’ve got you covered. Awesome BBQ area – Our outdoor area is the perfect place to chill out and unwind after an adventure packed day in Taupō!